It’s never too early to begin planning a career in an industry where your work helps make the world a more beautiful place while enriching the lives of millions of people annually. Whether your interests lean toward creative arts or sciences, you’re sure to find a satisfying and rewarding profession in floriculture. This diverse and colorful field offers you a wide variety of challenging and profitable career choices. 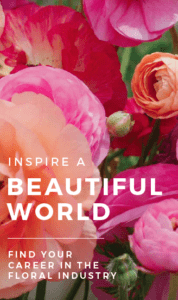 To learn more about careers in the floriculture industry, download the AFE Career Brochure! The brochure contains more detailed information about various floral industry careers and can help you decide which path might be right for you. AFE offers paid internship opportunities, as well as more than 20 different scholarships annually for undergraduate and graduate students. Learn more about AFE educational programs today to jump start your career in floriculture!